Atherosclerosis is characterized by the presence of flow-restricting plaques within arteries that consist of lipids, cholesterol, and cell debris. Platelet activation has been shown to be an early event in atherogenesis and is mediated by interactions with endothelial and mononuclear cells. Moreover, atherosclerotic plaques typically occur at arterial branches and other areas with disturbed blood flow, suggesting that flow-regulated factors may influence disease onset and progression. The enzyme ectonucleotide tri(di)phosphohydrolase-1 (CD39) is expressed by leukocytes and endothelial cells and inhibits both platelet activation and leukocyte recruitment. Yogendra Kanthi, Matthew Hyman, and colleagues at the University of Michigan and the University of Pennsylvania, respectively, found that Cd39 haploinsufficiency in an ApoE-deficient mouse model of atherosclerosis increases arterial plaque burden as well as circulating markers of platelet activation in response to a high-fat diet. Analysis of CD39 expression in arteries from ApoE-deficient animals revealed that CD39 is highly expressed in areas of stable flow but is repressed in atheroprone areas of disturbed flow. Moreover, disruption of blood flow in WT animals via injury of the carotid artery rapidly repressed CD39 expression. In human endothelial cells, CD39 was upregulated in response to unidirectional laminar shear stress, resulting in enhanced enzymatic activity. The transcription factor KLF2 regulates several atherprotective genes and is induced by laminar shear. The authors determined that KLF2 is required for CD39 expression and binds directly to the CD39 promoter. Together, the results of this study reveal that CD39 regionally regulates atherogenesis as the result of disturbances in blood flow. 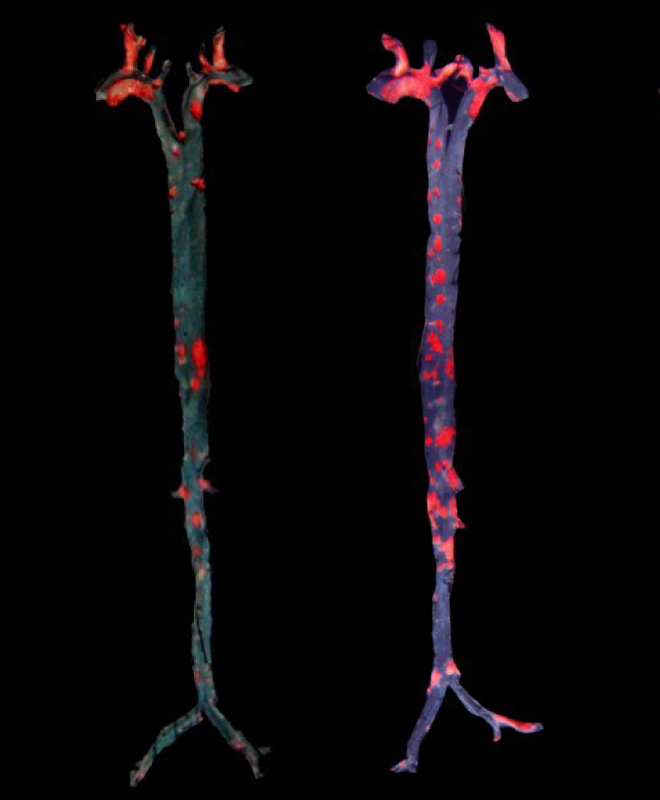 The accompanying images shows arterial plaque formation in Apoe-/- mice (left) and Cd39-/+ Apoe-/- mice (right). Note the increased burden in the Cd39-/+ Apoe-/- animals. Citation Information: J Clin Invest. 2015;125(8):3027-3036. https://doi.org/10.1172/JCI79514. The ability of cells to detect and respond to nucleotide signals in the local microenvironment is essential for vascular homeostasis. The enzyme ectonucleotide tri(di)phosphohydrolase-1 (ENTPD1, also known as CD39) on the surface of leukocytes and endothelial cells metabolizes locally released, intravascular ATP and ADP, thereby eliminating these prothrombotic and proinflammatory stimuli. Here, we evaluated the contribution of CD39 to atherogenesis in the apolipoprotein E–deficient (ApoE-deficient) mouse model of atherosclerosis. Compared with control ApoE-deficient animals, plaque burden was markedly increased along with circulating markers of platelet activation in Cd39+/–Apoe–/– mice fed a high-fat diet. Plaque analysis revealed stark regionalization of endothelial CD39 expression and function in Apoe–/– mice, with CD39 prominently expressed in atheroprotective, stable flow regions and diminished in atheroprone areas subject to disturbed flow. In mice, disturbed flow as the result of partial carotid artery ligation rapidly suppressed endothelial CD39 expression. Moreover, unidirectional laminar shear stress induced atheroprotective CD39 expression in human endothelial cells. CD39 induction was dependent upon the vascular transcription factor Krüppel-like factor 2 (KLF2) binding near the transcriptional start site of CD39. Together, these data establish CD39 as a regionalized regulator of atherogenesis that is driven by shear stress.